I arrived this afternoon to Mexico City to complete a commission for Transitio_MX02 Festival Internacional de Artes Electronicas y Video that kicks off October 12th for a week of exhibitions, panel discussions, screenings, performances, music… After getting a tour of the exhibition space that will be my home base Laboratorio Arte-Alameda and meeting a few of the coordinators, I went for a walk through the historical center of Mexico City. 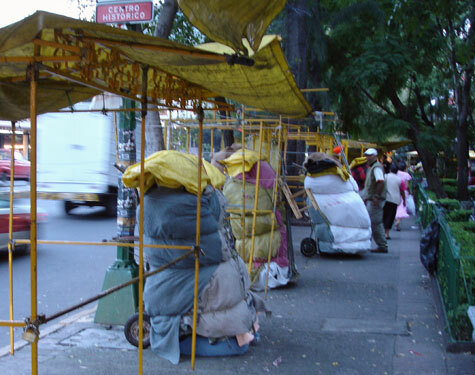 It’s been 12 years since I was last in Mexico City and the sidewalks seem even more crowded with street vendors than I remember. 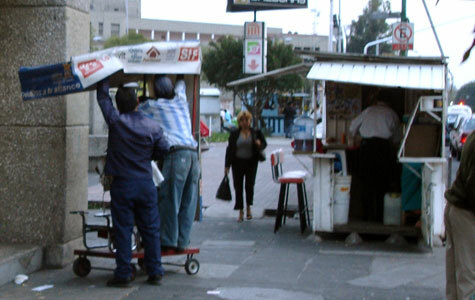 The street vendors in the historical center are a powerful force. When the civil administration has tried to get them of the sidewalks, the street vendors have united to present a powerful lobbying force. Today they are an institution that is not so much of an informal sector as a politically powerful entity that pays an undocumented tax to city representatives.Â It’s a gamble that some 65 thousand people take to set up a small business. 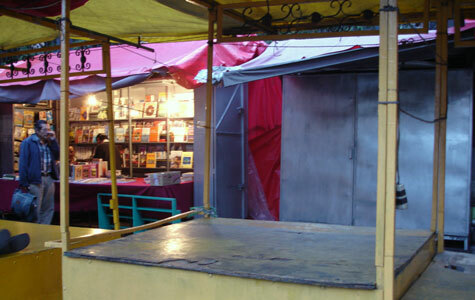 This evening, I went for a stroll at 7pm, just as many of the vendors are ending their day. 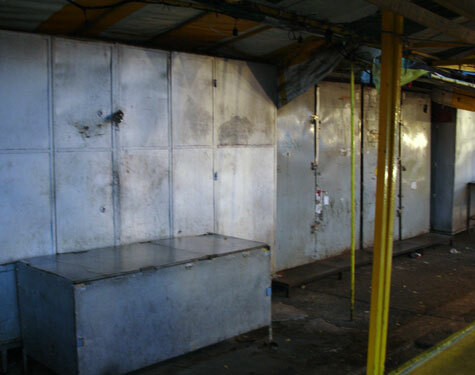 The steel frame of their stores are left empty, all goods are packed onto hand carts and pushed along the streets to secure outdoor parking lots where they pay to store their goods. The book stores look like large lockers that collapse into themselves and are padlocked.Â The current city administration is trying very hard to clean the street of its “ambulantes” or street vendors, it’s succeeded in some blocks only to see them relocate in other blocks that already have vendors, making it very difficult for pedestrians to make their way.Â The city in general is split, many of the people buy their goods from the street vendors at a portion of the price that they pay at a supermarket, so the street vendors become the market of choice.Â Whereas others, perhaps with greater means find them to be a nuisance. The store is packed and ready to be pushed to a secure parking lot for overnight storage. The frames remain, a permanent fixture of Mexico City’s Historic Center. One book store remains open when most have been shut and locked. By 7pm the mobile shoe shinning units are shutting down and being prepared for storage.